We are always curious to know how many of you struggle and get frustrated when it comes time to curl your shorter hairstyle. The answer to that question is probably many of you. That is why we always keep a lookout for curling irons that we feel will do a great job on short hair and then pass that information along to you. One curling wand that was suggested to us that it works well on short hair is the Infiniti Pro by Conair Tourmaline Ceramic Curling Wand. It certainly seems to have many of the characteristics that make a curling iron work well on short hair so we decided to take a closer look at it. Here is what we found. Most people who purchase this curling iron model from Conair to use on their short hair are very happy they did. Features like 5 different temperature settings (Max 400°F) and a ½” to 1” tapered barrel give you the options and versatility you need to curl your short hair. The barrel also features ceramic tourmaline infusion. This means that the Infiniti Pro by Conair Curling Wand will heat evenly and does not have damaging hotspots that are commonly found on other types of curling iron barrels. It also will go a long way to eliminate frizz and unsightly flyaway hairs. Tourmaline crystal infused barrels are known for giving your short hair a little shine when it’s styled too. There is nothing fancy about how this curling iron works. It has a very simple LED light temperature selection and a standard size 8-foot power cord. The power cord does come with an attached swivel end to keep the cord from tangling up as you use it. In order for any curling iron to be effective on short hair, it has to have a smaller size barrel. The Infiniti Pro by Conair Curling Wand has really got that covered. Its ½” to 1” tapered barrel is not only ideal for wrapping short hair around but it also gives you many different curl choices. 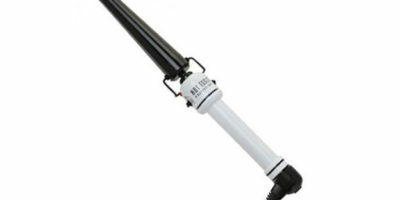 This curling iron is also lightweight and compact. 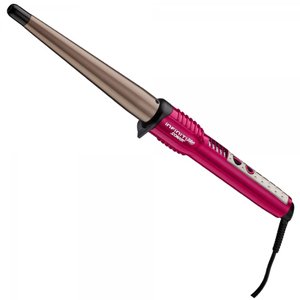 The Infiniti Pro by Conair Curling Wand is just a little under a foot long and weighs just 13 ounces. That is a big bonus because you have to move your curling iron a lot when using it on short hair and you have to angle it into tighter spaces to catch your short hair too. This curling iron from Conair has one of the best warranties you will ever find on a curling wand sold in its price range. You get a complete 5-year limited warranty with it when you make your purchase. 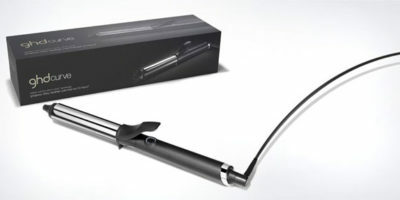 There are a few things we did not care for with the Infiniti Pro by Conair Curling Wand. One of those is the fact that we thought the LED display was a little bit to the ‘cheesy’ side. A nice digital readout would have been better and probably could be added without raising the price of this curling iron too much. You would think that this curling iron would make a great travel dryer because of its lightweight and compact size. The Infiniti Pro by Conair Curling Wand is great to take with you as you travel around America but sad to say you can’t take it overseas with you. It has no dual voltage capability. This is a very simple but effective curling iron to use on your short hair. It does not come with a lot of bells and whistles but don’t mistake that for meaning it won’t do a great job on your shorter hairstyle. The Infiniti Pro by Conair Curling Wand has a good variety of heat settings, is easy to use and gives you the ability to make a variety of different curls. It is definitely worth checking out more before purchasing a curling iron to use on your short hair.